John Battelle's Search Blog Facebook’s Real Question: What’s the “Native Model”? Facebook’s Real Question: What’s the “Native Model”? The headlines about Facebook’s IPO – along with questions about its business model – are now officially cringeworthy. It’s an ongoing, rolling study in how society digests important news about our industry, and it’s far from played out. But we seem at an interesting tipping point in perception, and now seemed a good time to weigh in with a few words on the subject. Prior to Facebook’s IPO, I drafted a post about its core business model (targeted display advertising), but decided not to publish it. The main thrust of my post is below, but I want to explain why I didn’t post right away, and provide you all with something of a “tick tock” of what’s happened over the past few days. The truth is, I didn’t post last week because I didn’t feel like piling on to what was becoming a media frenzy. Less than 24 hours before the biggest Internet IPO in history, the negative stories questioning Facebook’s core revenue model were coming fast and furious. My piece wasn’t negative, per se, its intention was to be thoughtful. And in the face of a media scrum, I often pull back until the dust settles. (There’s a media business in there somewhere, but I digress). Well, that didn’t happen. Compared to Google’s IPO, which was controversial for very different reasons (they ran a “modified auction,” remember? ), the Facebook IPO is quickly becoming the biggest story in tech so far this year. And unfortunately for the good people at Facebook, it’s not a positive one. The starting gun of Facebook’s IPO woes was the news that GM planned to pull its $10 million spend – but would continue to invest around $30 million in maintaining its Facebook “presence.” Interestingly, that $30 million was not going to Facebook, but rather to GM’s agency and other partners. I’m not sure how that $30 million is spent – that’s a lot of cheddar to have a presence anywhere (you could build about 15 Instagrams with that kind of money, for example). But most have speculated it goes to staffing social media experts and working with companies like Buddy Media, buying “likes” through third party ad networks, and maintaining a burgeoning amount of content to feed GM’s myriad and increasingly sophisticated presence on the site. “It’s one of the most powerful branding mechanisms in the world, but it’s not an advertising mechanism,” said Martin Sorrell, chief executive of WPP, the giant advertising agency. It seems, just ahead of the IPO, folks were realizing that Facebook doesn’t work like Google, or the web at large. It’s a service layered on top of the Web, and it has its own rules, its own ecosystem, and its own “native advertising platform.” In the run up to the IPO, a lot of folks began questioning whether that platform stands the test of time. I’ll have more thoughts on that below, after a quick review of the past few days in FacebookLand. As I outlined above, Facebook faced a building storyline about the efficacy of its core revenue model, right before the opening bell. Not a good start, but then again, not unusual for a company going public. One of the inevitabilities of negative news about a company is that it begets more negativity – people start to look for patterns that might prove that the initial bad news was just the tip of an iceberg. When word came out last week that demand for the stock was so high that insiders planned to sell even more shares at the open, many industry folks I spoke to began to wonder if the “greater fool” theory was kicking in. In other words, these people wondered, if the bankers and early investors in Facebook were increasing the number of shares they were selling at the outset, perhaps they knew something the general public didn’t – maybe they thought that $38 was as high as the stock was going to get – at least for a while. That quote would prove prescient. As Facebook opened trading last Friday, the stock instantly shot up – always taken as a good sign – but then it began to sink. Were it not for significant supportive buying by the offering’s lead banker, the stock would have closed below its opening price, an embarrassing signal that the offering was poorly handled. Facebook closed its first day of trading up marginally – not exactly the rocketship that many expected (a crowdsourced site predicted it would soar to $54, for example). Then things got really bad. Over the weekend, officials at NASDAQ, the exchange where Facebook debuted, admitted they bungled the stock’s opening trades due to the massive demand, citing technical and other issues. Monday, the Wall Street Journal, among many others, questioned Morgan Stanley’s support of the stock. To make matters worse, the stock slid to around $34 by the end of the day. A frenzy of media coverage erupted – including a number of extraordinary allegations, first made late Monday evening, around insider information provided verbally to institutional investors but not disclosed to the public. That information included concerns that Facebook’s ad revenues were not growing as quickly as first thought, and that mobile usage, where Facebook’s monetization is weak, was exploding, exposing another hole in the company’s revenue model. In other words, what my industry sources suspected might have been true – that insiders knew something, and decided to get out when the getting was good – may have been what really happened. True or not, such a story taints the offering considerably. Predictably, those allegations have spawned calls for investigations by regulatory authorities and lawsuits or subpoenas by individual investors as well as the state of Massachusetts. On Tuesday, the stock sank again, closing at near $31, $7 off its opening price and more than $10 off its high point on opening day. Not exactly a honeymoon for new public company CEO Mark Zuckerberg, who got married last Sunday to his college sweetheart. Today’s early trading must provide at least some comfort – Facebook is trading a bit up, in the $32 range, a price that many financial news outlets reported as the number most sophisticated investors felt was correct in the first place. Is the worst of it over for Facebook’s IPO? I have no idea. But the core of the issue is what’s most interesting to me. Stepping Back: What’s This Really All About? Facebook is a very large, very profitable company and I am sure it will find its feet. I’m not a stock analyst, and I’m not going to try to predict whether or not the company is properly valued at any price. But I do have a few thoughts about the underlying questions that are driving this whole fracas – Facebook’s revenue model. Facebook makes 82% of its money by selling targeted display advertising – boxes on the top and right side of the site (it’s recently added ads at logout, and in newsfeeds). Not a particularly unique model on its face, but certainly unique underneath: Because Facebook knows so much about each person on its service, it can target in ways Google and others can only dream about. Over the years, Facebook has added new advertising products based on the unique identity, interest, and relationship data it owns: Advertisers can incorporate the fact that a friend of a friend “likes” a product, for example. Or they can incorporate their own marketing content into their ads, a practice known as “conversational marketing” that I’ve been on about for seven or so years (for more on that, see my post Conversational Marketing Is Hot – Again. Thanks Facebook!). But as many have pointed out, Facebook’s approach to advertising has a problem: People don’t (yet) come to Facebook with the intention of consuming quality content (as they do with media sites), or finding an answer to a question (as they do at Google search). Yet Facebook’s ad system combines both those models – it employs a display ad unit (the foundation of brand-driven media sites) as well as a sophisticated ad-buying platform that’d be familiar to anyone who’s ever used Google AdWords. I’m not sure how many advertisers use Facebook, but it’s probably a fair guess to say the number approaches or crosses the hundreds of thousands. That’s about how many used Overture and Google a decade ago. 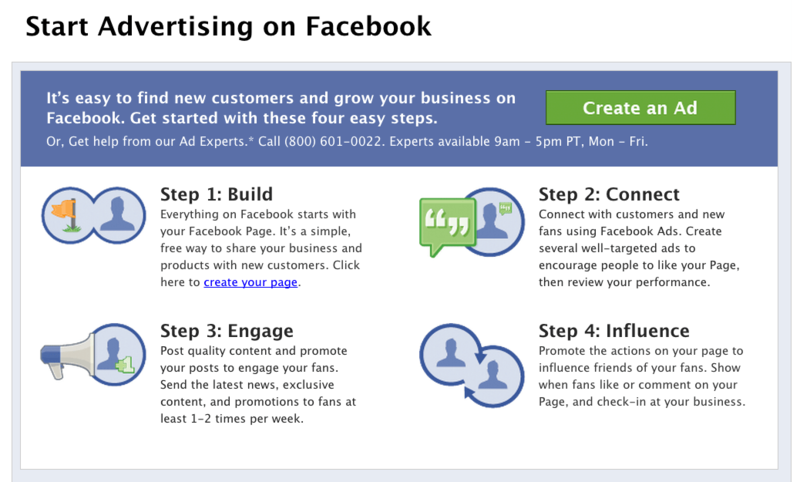 The big question is simply this: Do those Facebook ads work as well or better than other approaches? If the answer is yes, the question of valuation is rather moot. If the answer is no…Facebook’s got some work to do. No such question hung over Google upon its stock debut. AdWords worked. People came to search with clear intent, and if you, as an advertiser, could match your product or service to that intent, you won. You’d put as much money as you could into the Google machine, because profit came out the other side. It was an entirely new model for advertising. I think it’s fair to say the same is not yet true for Facebook’s native advertising solution. And that’s really what Facebook Ads are: the biggest example of a platform-specific “native advertising” play since Google AdWords broke out ten years ago. But it’s not clear that Facebook’s ad platform works better than any number of other alternatives. For brand advertisers, those large “rising star” units, replete with video capabilities and rich contextual placements, are a damn good option, and increasingly affordable. And if an advertiser wants to message at the point of intent, well, that’s what Google (and Bing) are for. It’s astonishing how quickly Facebook has gotten to $4billion in revenue – but at the end of the day, marketers must justify their spend. Sure, it makes sense to engage on a platform where nearly a billion people spend hours each month. But the question remains – how do you engage, and who do you pay for that engagement? Facebook is huge, and terribly successful at engaging its users. But what GM seems to have realized is that it can engage all day long on Facebook, without having to pay Facebook for the privilege of doing so. Perhaps the question can be rephrased this way: Has Facebook figured out how to deliver marketers long-term value creation? The jury seems out on that one. Now that Facebook is public, it will face relentless pressure to convince that jury, which now demonstrates its vote via a real time stock price. That pressure could force potentially new and more intrusive ad units, and/or new approaches to monetization we’ve yet to see, including, as I predicted in January, a web-wide display network driven by Facebook data. The key question when trying to value Facebook’s stock is: can they find another business model that generates significantly more revenue per user without hurting the user experience? A good question, and one I can only imagine folks at Facebook are pondering at the moment. Currently, Facebook’s ads are, in the majority, stuck in a model that doesn’t feel truly native to how people actually use the service. Can Facebook come up with a better solution? Integration of ad units into newsfeeds is one approach that bears watching (it reminds me of Twitter’s approach, for example), but I’m not sure that’s enough to feed a $4billion beast. These questions are fascinating to consider – in particular in light of the “native monetization” craze sweeping other platforms like Tumblr, Twitter, Pinterest, and others. As I’ve argued elsewhere, unique approaches to marketing work only if they prove a return on total investment, including the cost of creating, optimizing, and supporting those native ad units when compared to other marketing approaches. Facebook clearly has the heft, and now the cash, to spend considerable resources to prove its approach. I can’t wait to see what happens next. If brand messaging is what Facebook ads deliver, they’ll have to compete with TV, which does a way better job, I’ve heard, and rich media display on the web. But you can’t trade money for something that can’t be measured. You can actually build your brand by delivering great products. The point of online advertising with little textboxes (Eg. Google) is to bring traffic to your site. Useful traffic. Traffic that leads to sales. And FYI. Having a FB page isn’t really ‘branding’…It’s just another Social Media page. Facebook’s ad revenues have always been a point of contention for the site, even before the company went public. The site has always been dodgy about how much entities really stand to earn from its ad revenues. Support creation of personal data market with revenues shared by users and build its transaction business by sacrificing revenues for political and charitable contribution while retaining them in commercial transactions. The first, while likely only a very small amount to each user, may be of some assistance in alleviating the feeling among user’s that they’re… well… being used. The second, by offering a neutral vehicle for the networking of the micro-contribution in lobbying, establishes facebook as the stable core of a vital and persistant civic-oriented network. This isn’t actually the optimal way to form this civic network… which may be better in some more autonomous formulation… but if I was facebook that’s what I’d try to pull-off. The potency of this form of networked contribution seems to be unrecognized… but somehow such things end up getting figured out eventually. I very much doubt Facebook would do this. Though if it did, it’d be quite a story. Stop making cows. Quit being calves. In this configuration facebook might not exist at all… but be replaced by a multitude of user-controlled ‘tools’ doing much the same thing. I believe that this network can be catalyzed… and may have a few ideas on how to help it along. I suspect the commons-dedicated account could be helpful here whether under a cow/calf model or something built around this “personal event network” idea… but I do tend to ‘talk my own book’. “Causes” the facebook add-on COULD have been a blockbuster if connected with this commons-dedicated account idea… and would have anchored the user both to the account and expanded potentials for the facebook platform… but would certainly have made it a more difficult product to launch. However, as it is I don’t think its added much capability. P.S. I’m really not much of a ‘kumbayah’ guy… I just don’t like things that don’t work when the should and could. Yes, I’ve been on about this concept for years. I think it’s inevitable. And I’ve know since April ’07 that it’s inevitable… even the patent office seemed excited. They must be wondering what happened. It’s sure got me stumped. If you (and everyone else) could… with a click on a link in an email or text message contribute just 25 cents for or against some piece of legislation… WOULD YOU? And what effect might that have on interest groups seeking funds? And on the political process? Brilliant. Thanks, John. I think Facebook soiled the advertising channel from the get-go by allowing extremely low-quality ads to pervade the sidebar real-estate for too long. This took root in users’ minds and trained us not to click.. It was as if their initial reluctance towards advertising hurt their only viable, long-term business model. I also think Facebook bought Instagram because Twitter would have, and probably should have, first. It fits the Twitter format to a tee. Thank you Ryan, and I agree on the Instagram Twitter fit. Interesting point about early ads, I agree with it, though would like to see it proven out with some research, hard to do. Actual social interactions are very complexly layered compared to search which is actually a less complex activity relatively speaking. Facebook does not capture this complexity, only data and very limited in this context. Hence the gap between intent and ad shown compared to Google. If they can execute on capturing more of this complexity, the ad relevance can only go up. They really need to grow beyond ‘Likes’ for this. Indeed they do. And they are very well positioned to, if they can crack the real social nuances of our interactions. I think this is what Timeline is about as well, it’s personal media, where, if they get it right, brands could play in a very big way. As always enjoyed your thoughts, John. Not sure why you didn’t address their underlying pr / political problem. If everyone likes you you can get away with an awful lot more than if you are less popular. Mark Zuckerberg looks especially, what shall we say, greedy/power hungry to retain so much control while raising so much money for the company and paying off so handsomely for others. Its hard to look at his situation and say his priority is the tech industry or American business or much else besides Mark Zuckerberg. Its not the worst thing ever but if you have a bad pr experience the lack of extra buffer can make a difference. And as you have mentioned elsewhere, that their first priority is not their user’s interests makes them smell a little. They feel very very different from Google in this respect. They benefit from a system of “increasing returns” and moats rather than from superior customer experience. Its not that getting there was easy but that the Google early approach of building in the most speed so that their users could get to where they wanted to get which seemed not necessarily in Google’s self-interest is hardly visible anywhere in the Facebook approach. Anyway, I was delighted to see so much egg on their faces. I think they’ve earned it, richly and hope that they continue facing questions over their selfishness and self-servingness. What I think is especially disappointing with this story is that there wasn’t more outcry from the tech world for the Zuckerberg control issue. This I find disturbing. I think the Silicon Valley community should have spoken out against his getting away with this as I think it makes all of them look bad, really awful. Too bad there are so few, if any, long-term stakeholders. That’s another 2500 word post. It will come, and I have covered portions of it, similar to the “Facebookistan” piece in the New Yorker yesterday (see my Twitter feed). Thanks John. So gracious of you to reply. Yeah I loved the Coll piece on Facebookistan. It’s ironic that the financial side would cause focus on the general approach. I mean why call attention to the entrails of such an operation when the getting is so good? I wonder if this ipo will have comparable influence to the Netscape one. Couldn’t happen to a more deserving organization. Look forward to the post and to the book. Oh and you know but once again, with power and great fortune (and incredible luck) comes responsibility, at least to me. Not sure how that seems to get so lost in the money culture which can last only so long if it’s just about money. Cheers! Everyone needs to live by their convictions, right or wrong! The main point I’m making, we are all blessed enough to have the choice – activate, deactivate Facebook; participate or don’t in the IPO; build your own social site or select from others and finally, voice your objections or not! I respect your post, it demonstrates some deeper meaning but I also have tremendous respect for MZ! He’s south of 30, with nearly a billion people to satisfy. Criticism is often packaged with success but my gut hunch tells me, Mark’s not afraid to face all the recent challenges and correct the misfires! Agreed. Nothing I write should imply I want anything other than for all folks like Mark to thrive. As long as we don’t get too in each other’s way. Thanks for your generous disagreement. I think Zuckerberg is smart and worked very hard and can face criticism. I also believe that we all affect one another. And some things are garnered by very very hard work but derive a certain monopoly power. That’s the problem as I see it. One may not leave Facebook not because the service is so wonderful but because others are there. If all that info is portable Facebook could be over time in trouble. But I don’t think it’s so much that Facebook is unique as thats where the action ended up being. It’s a tall order for MZ. But, at least to me, there are limits to one’s being self-serving. Thanks again for you pov and engagement. This is still early days for Facebook and the monetization of social networks as the grander scale theme here. So, they will continue to command a multiple that is more commensurate with their sales growth rate than it is with their P/E ratio. very good post which I am late to read. I think their key goal (as others have stated) will be monetizing their mobile members. However, the bigger question is really that one that @wmoug:disqus mentioned which revolves around the economic value of social networks and how to effectively measure ROI.